Imperfect. The Lenovo ThinkPad T440p belongs to a line of classic business notebooks and aims itself at professional users in particular. With high-performance components, multifaceted interface options, a large battery, and the usual ease in installing upgrades, the signs are all good. 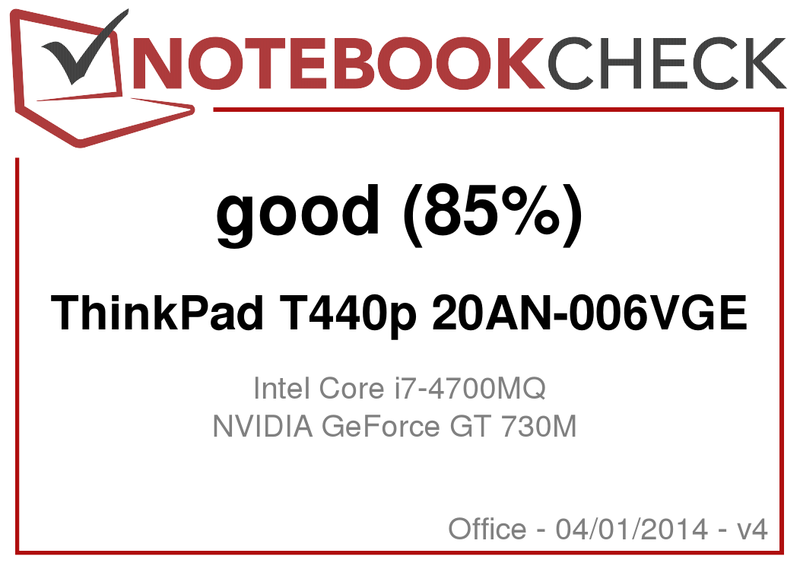 We comprehensively tested whether the ThinkPad T440p is really convincing in the final analysis. 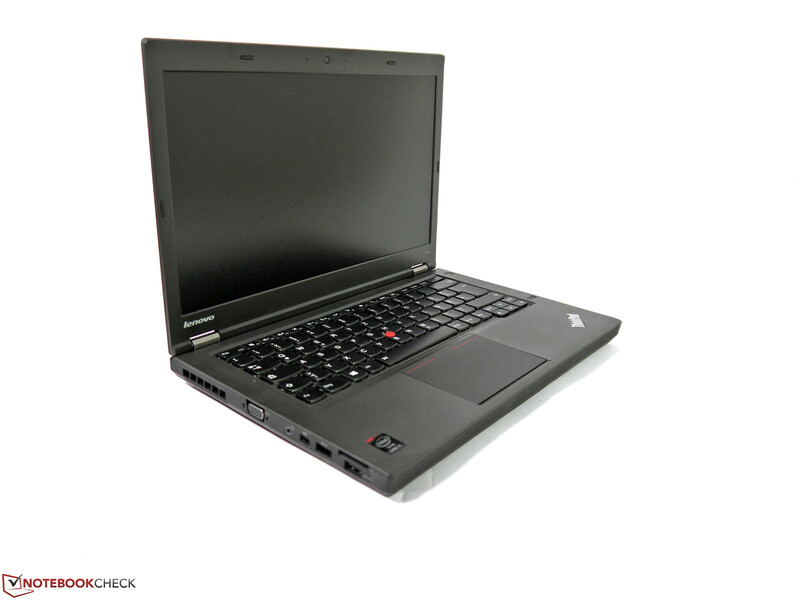 Apart from the flat, light, spartan models that make up the S-Series ThinkPads and other T440 models, Lenovo also carries a classically configured top performer. Here the emphasis is not on slimming down the weight and extending the battery life, but on providing high performance with optimal connectivity options. It goes without saying that the typical characteristics of business notebooks - stability, reliability, available service and warranty options, excellent input devices and a correspondingly good display - must not be absent. Our test machine has an Intel Core i7-4700MQ CPU, 8 GB RAM, a 500 GB hard drive, Nvidia's GeForce GT 730M graphics card with Optimus function, and a 14-inch HD+ Display all at its disposal. 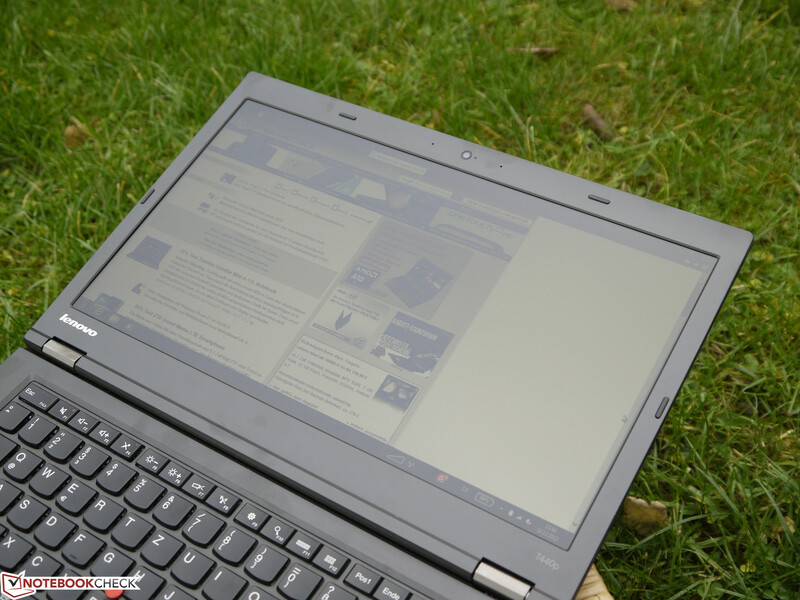 The price is around 1,650 Euros (~$2,250), qualifying the ThinkPad T440p as a genuine premium notebook. 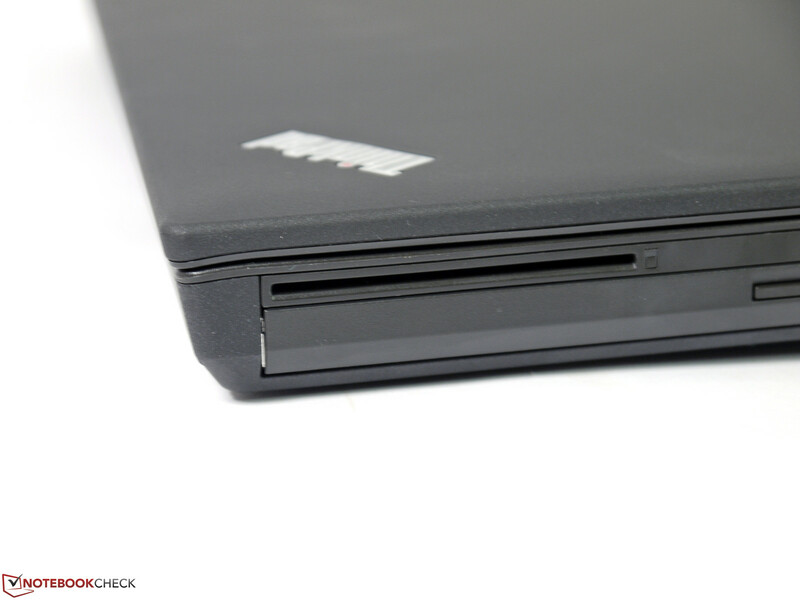 As we noted in our review of the Lenovo ThinkPad T440s, our ThinkPad T440p uses the new surface material of the current models' generation. It is somewhat more finely textured, its look and feel is pleasing, and it resists fingerprints longer than its predecessors can. 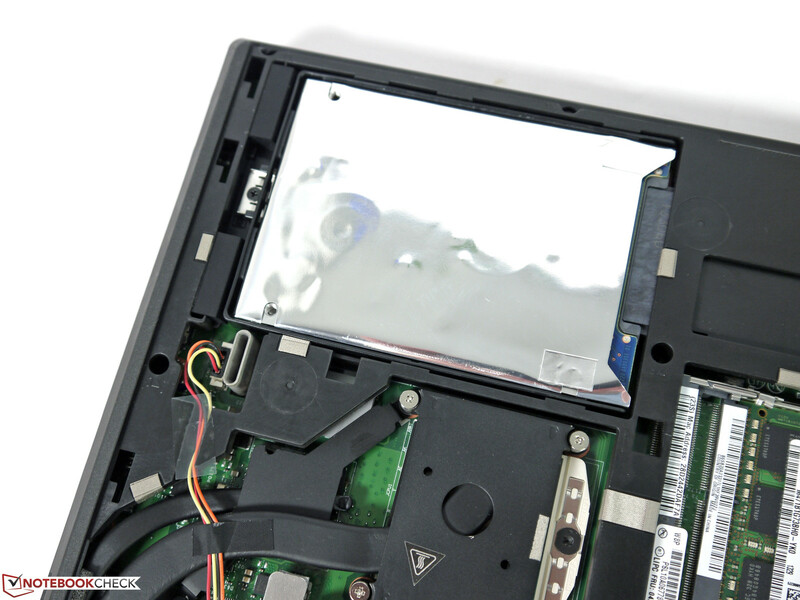 All in all, the ThinkPad T440p's optics are first-class; this is definitely from the typical ThinkPad mold. 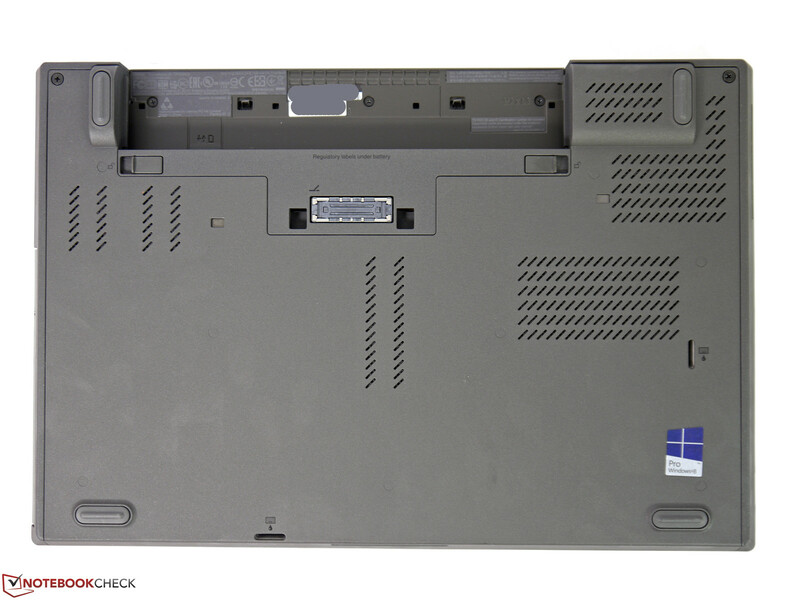 Still, we found the same weak points in the case that we earlier identified in the ThinkPad T430. On the right side, the part of the wrist rest that sits above the optical drive and smart card reader is easy to compress. Between the unchanged (and excellent) display hinges, the display frame is quite bendable, belying our previous impression of premium quality. The area above the battery compartment is also in need of improvement; when the battery is absent, it can be compressed with even minor force. While these weak points should not cause any ill effects in overall stability and everyday use, they do add up to a blemish on the machine's overall impression in such a high price class. The test machine weighs 2,220 grams (~4.9 pounds), almost exactly 700 grams (~1.5 pounds) more than the ThinkPad T440s. Moreover, that is without a DVD drive. The available ports cover a wide segment of the connectivity spectrum and offer the right connection for many situations. By now, though, users must forswear nearly exotic ports like FireWire and eSATA. These can also no longer be attached via an ExpressCard. On the other hand, the docking station offers numerous other connectivity options in stationary use. 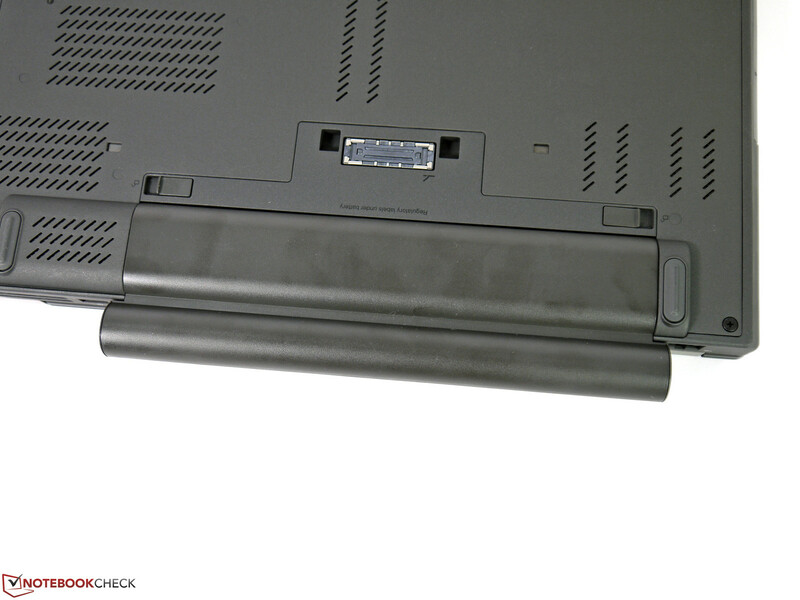 It is a pity that Lenovo altered its docking interface; other available docking stations from the current notebook generation can no longer be used with this machine. The same is true for the power cord; users who hoped to employ a travel power cord or a higher performing variant will have to go out and buy new versions. This could be a huge drawback, and not just for companies with numerous devices sitting cheek by jowl. Additionally, the ThinkPad T440p itself sports 2 x USB 3.0, 2 x USB 2.0, a mini display port, an SDXC card reader, and Gigabit LAN. 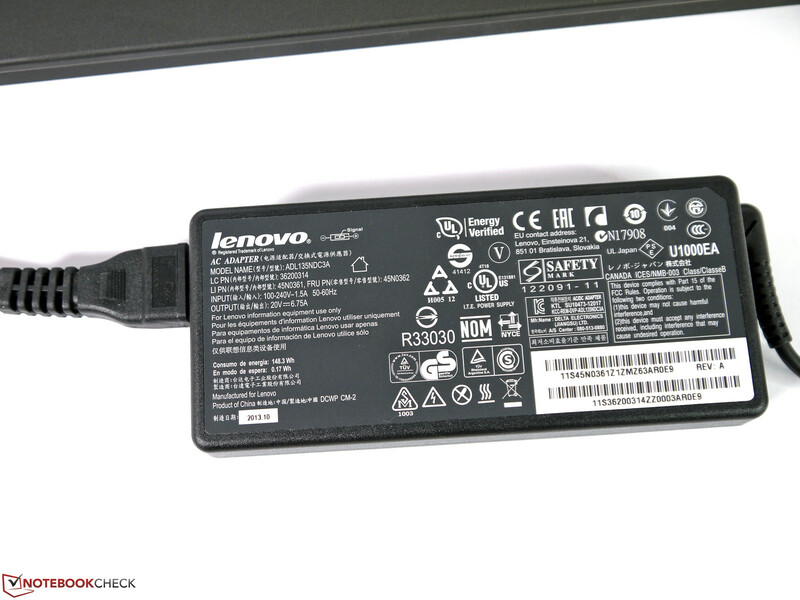 On the right side, Lenovo has spaced the two USB ports widely enough apart that users can insert fairly wide components without blocking the neighboring port. On the other side of the ledger, it is no fun to connect to older monitors and displays over the analog VGA input. On an external Asus ProArt 23-inch IPS display, the VGA connection produced a visibly blurry image. After a while, this begins to drive the viewer crazy, and it can really only be used as a stopgap measure. Our test machine's communications features offer just about everything the heart desires: fast WLAN per 802.11ac, over WWAN (HSPA), and via Bluetooth 4.0. 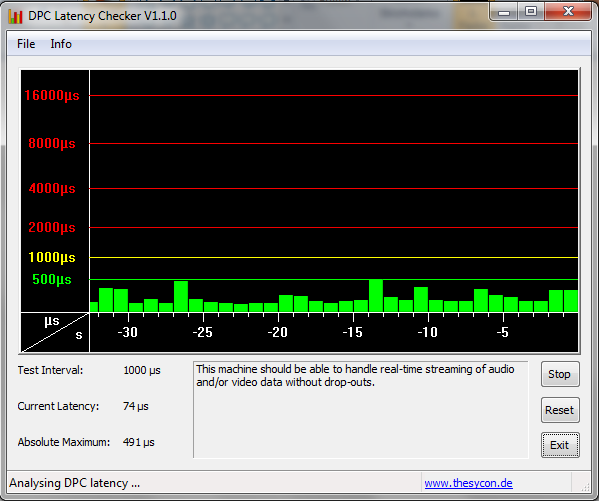 All that this ThinkPad lacks is Turbo LTE for data. The WLAN signal quality rates as above average and maintains a connection even when an Atheros AR9485 from the Asus N76VZ would lose it. It has two antennae at its disposal, and in theory, it should reach 867 Mbit/s over an 802.11ac network. Lacking an 802.11ac router, we did not measure its speed in practice. 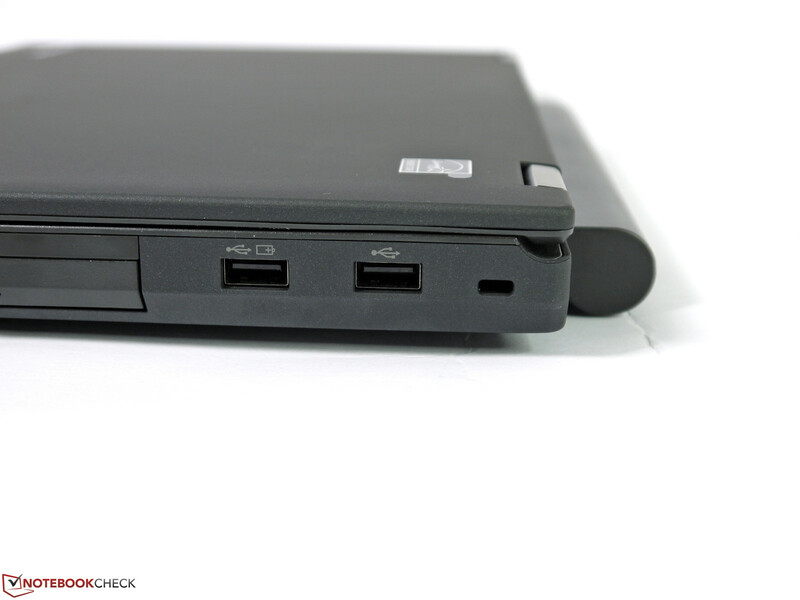 As with the ThinkPad T440s, the 720p webcam delivers passable quality for video chats in well-lit rooms. The image becomes blurred and compromised in less conducive lighting conditions. Lenovo offers some solid basic features here. Apart from the usual fingerprint reader, the user can also employ a smart card reader and a Trusted Platform Module 1.2 (TPM 2.0 on Win 8). An NFC chip is supposed to be optionally available (we could neither configure one nor find it in our test machine), and Intel Anti Theft and the Computrace service can be activated in BIOS (F1). In our test machine's default settings, Secure Boot was deactivated. Additionally, the usual BIOS and system password options are available. As usual, the docking port is on the underside, but can only accept Lenovo's new CS13 docking station (Basic, Pro and Ultra). 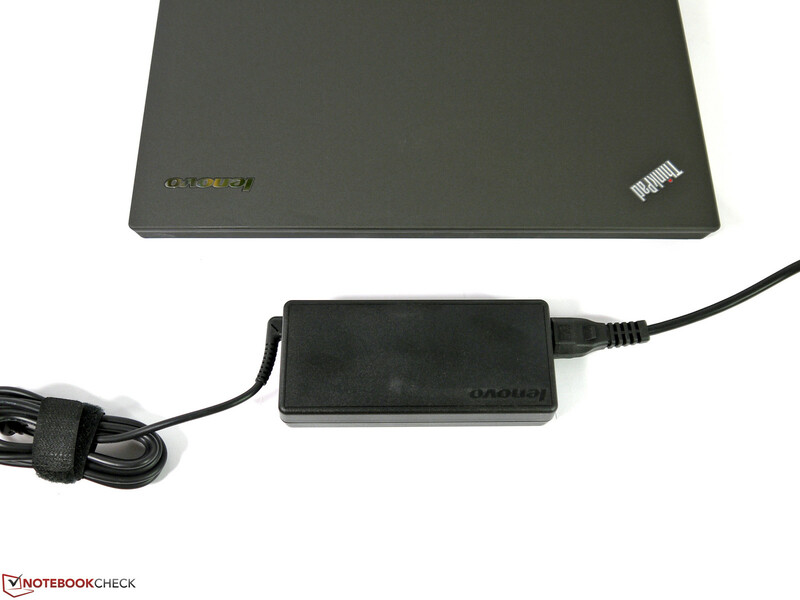 The ThinkPad Pro Dock with 65-W power cord 40A10065EU costs about 150 Euros (~$200) and offers a display port, DVI-D and VGA ports. The hatch is secured with two screws and can be prized open relatively easily. This offers the user access to nearly all components. 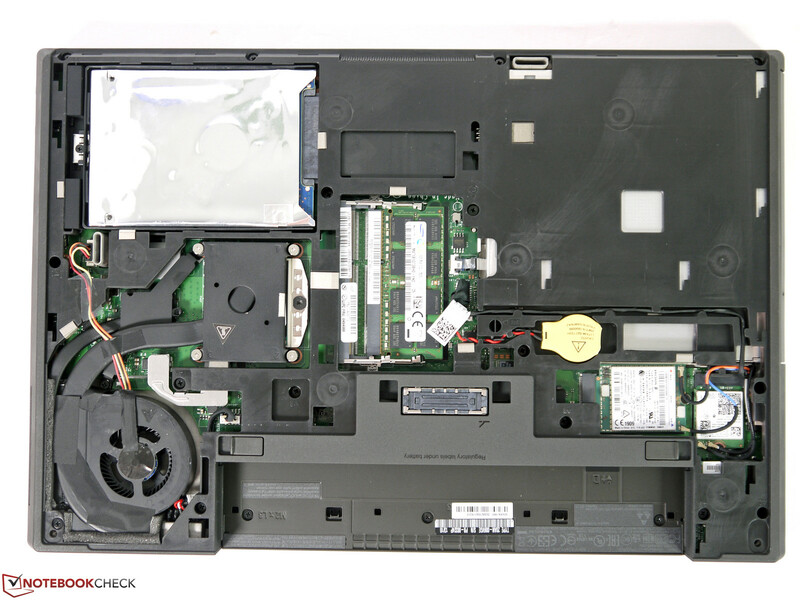 Lenovo explains in its hardware maintenance manual which components can be switched out without compromising the warranty. 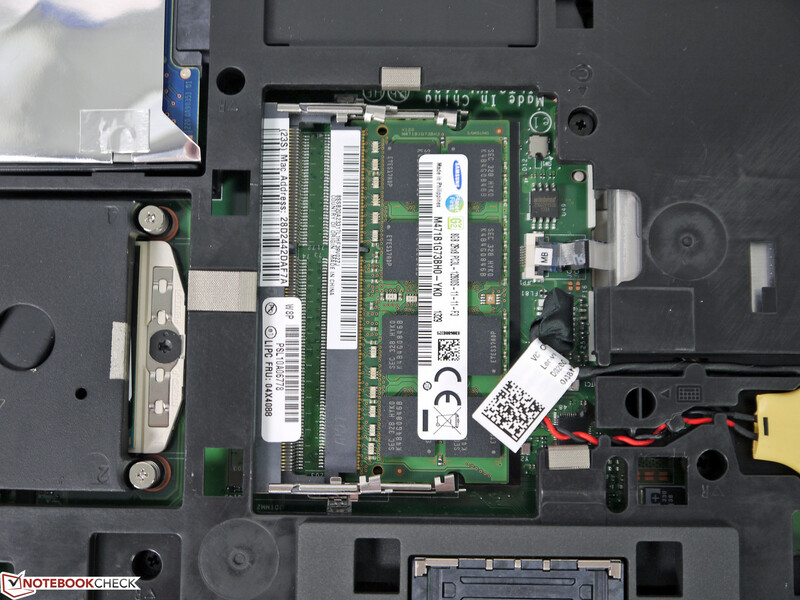 The user can fairly easily swap in a solid-state drive for the conventional hard drive and add an additional module of memory (one slot is open). 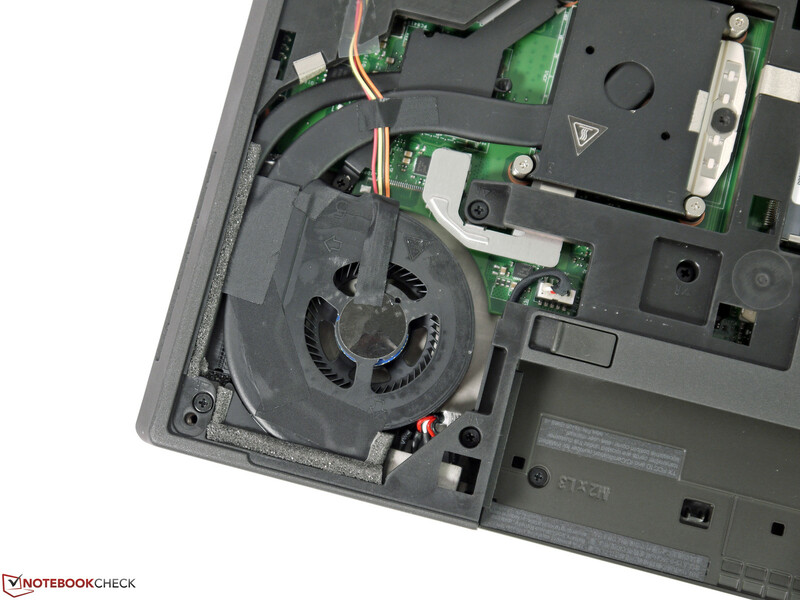 The fan is easily accessible and can be cleaned when necessary. 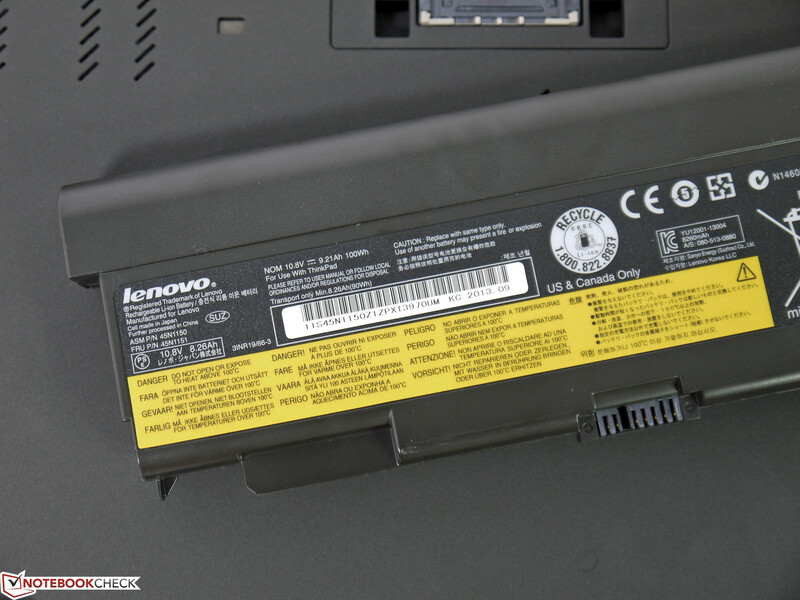 Lenovo offers a 36-month manufacturer's warranty. This can be extended or expanded with additional services. For example, an additional three years of accident protection cost 111 Euros (~$150); an extension to a four-year warranty costs 80 (~$110). 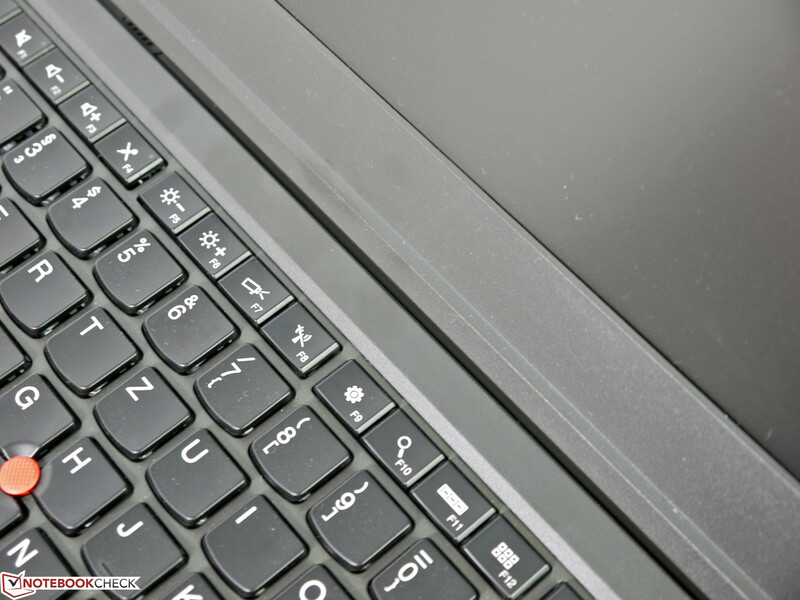 The chiclet keyboard is well made and reflects typical ThinkPad quality. The keys offer a moderate stroke and a good pressure point; the stroke noise is quite quiet. The keyboard mat is firm and does not give easily. We noticed neither bobbing keys nor clattering nor any other weaknesses. One minor point of criticism: the arrow keys. They are somewhat close together, sometimes leading to typos. Apart from these, the keys are sufficiently large, arrayed in a 19-mm grid, and labeled with good contrast. The integrated key backlighting has two levels and makes the keys easily readable under dark conditions. Users can safely avoid ThinkLight, which was formerly integrated in the display. 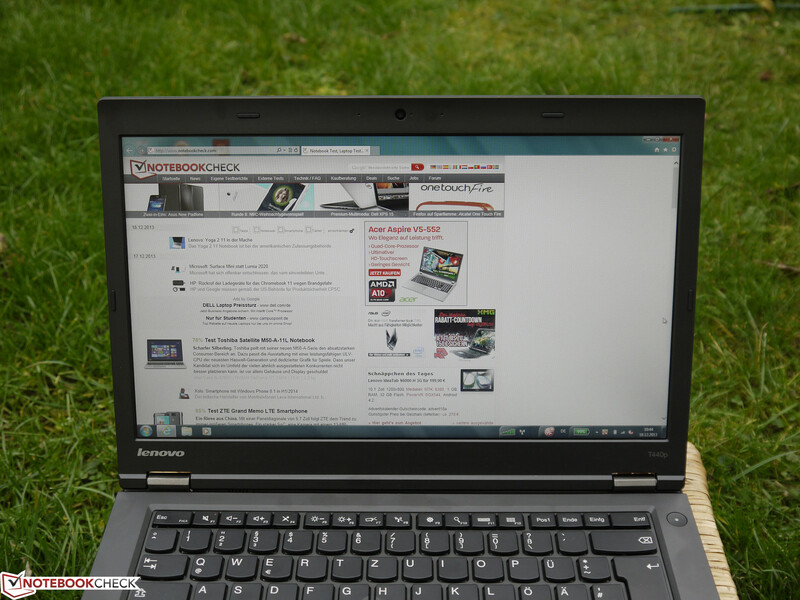 The layout has a few peculiarities that newcomers to Lenovo will have to get used to. For example, "Strg" and the Windows key are switched on the left side, and the printer key is to the right of "AltGr." 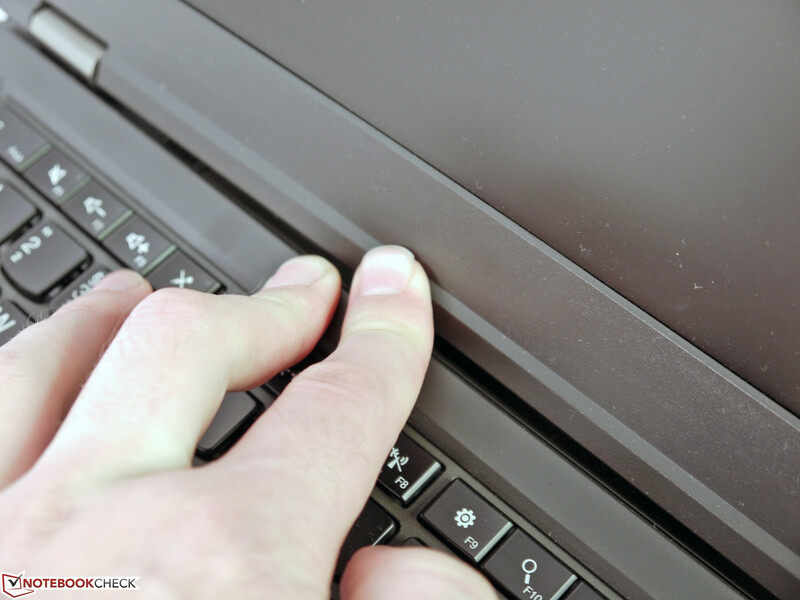 The audio control keys, which in the ThinkPad T430 were outside of the keyboard, have been integrated into the keyboard layout as an FN combination. The touchpad has a 100 x 75 mm (~3.9 x 3.0 inch) glass surface with excellent swiping capabilities. Multiple-finger gestures are cleanly recognized, even when only using fingertips. The entire input surface can be pressed down, replacing the previously separate touchpad and TrackPoint keys. 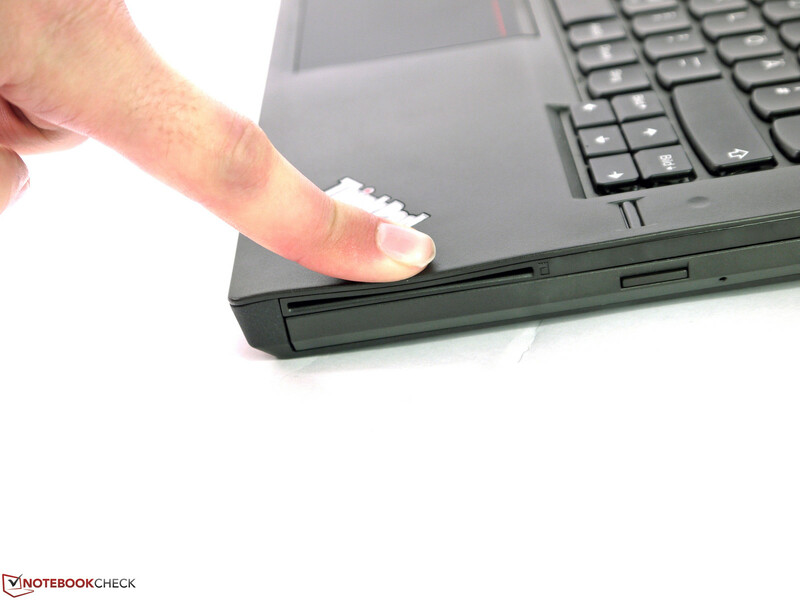 Lenovo describes this as a 5-key ClickPad. 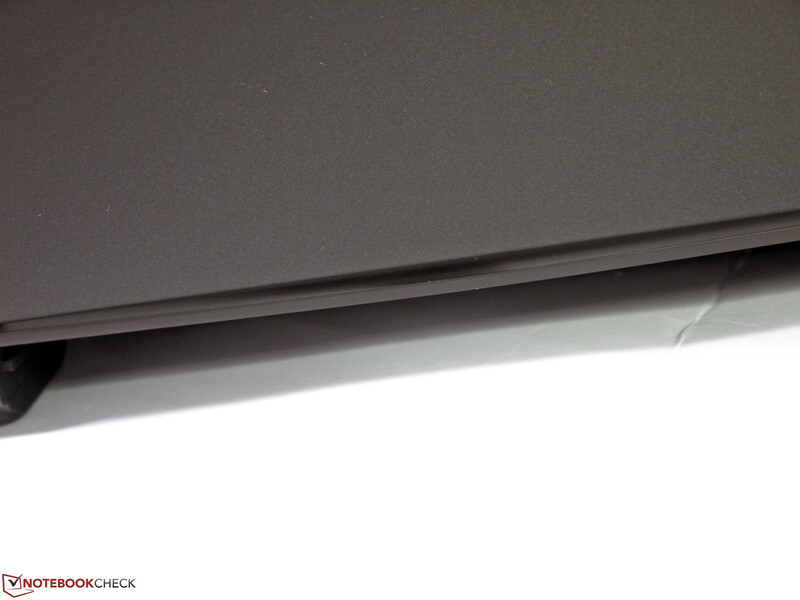 Below this, where the touchpad keys used to be, we registered a reliable acceptance of both taps and clicks. It also distinguishes very well whether the user intends a right or left click. However, the whole does not work too well in conjunction with the TrackPoint. Working with the upper side of the ClickPad takes a lot of getting used to. In hindsight, we found the previous touchpad solution more comfortable and reliable. Lenovo offers three different matte displays for this ThinkPad T440p. The entry-level option is a TN HD display (1366x768 pixels), moving up through the TN HD+ display (1600x900, online price 97 Euros, ~$130) to the IPS FHD display, which at 136 Euros (~$185) is still quite affordable. 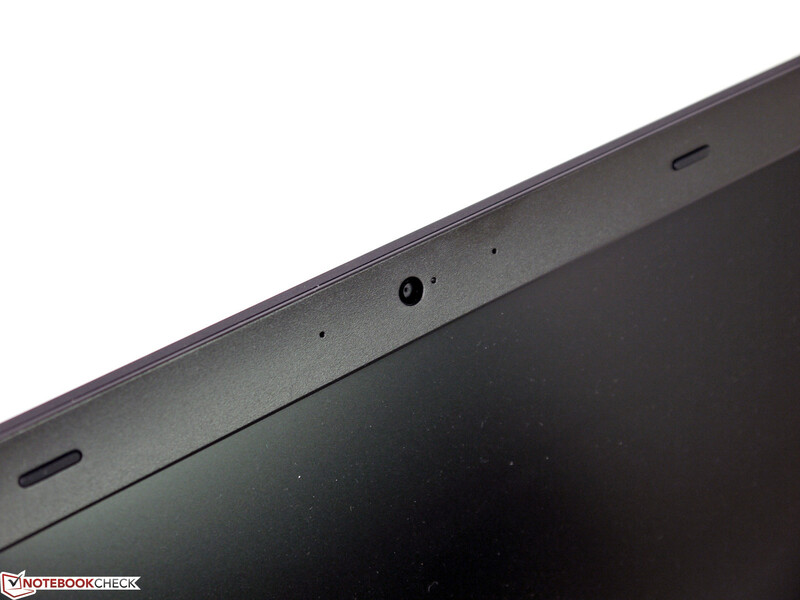 In our test update on the Lenovo ThinkPad T440s, we will be putting the IPS display under the microscope. 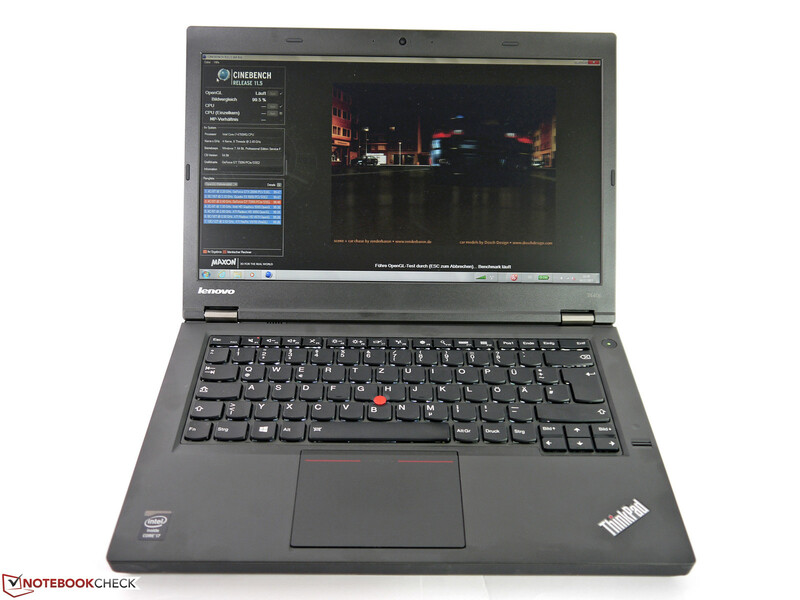 The mid-range variant is built into our test product and is produced by Chimei Innolux, not by AU Optronics, which produced the display for the Lenovo ThinkPad T440s. 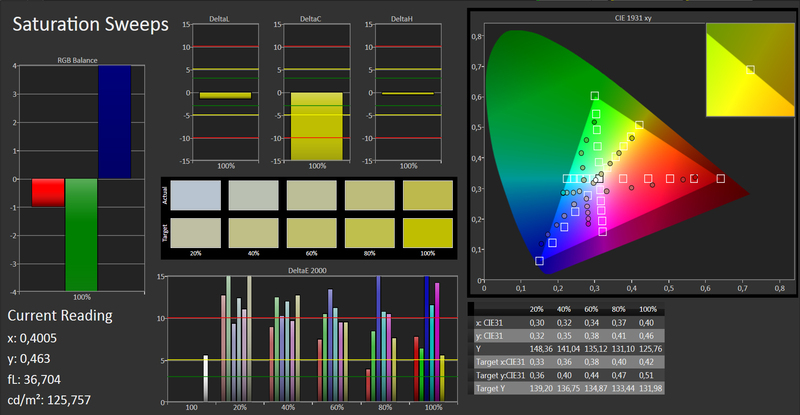 Although both panels have a brightness of 250 cd/m² and a contrast of 400:1 in their specs, we noticed some small deviations. 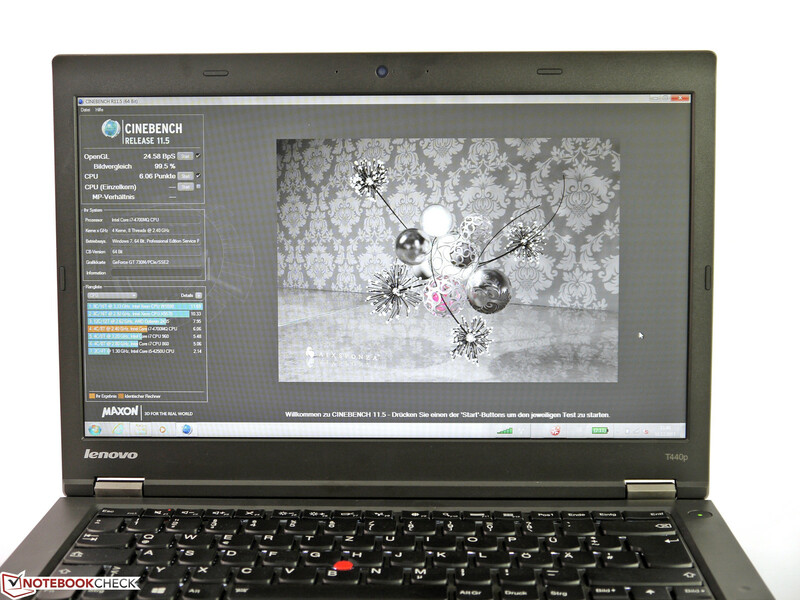 In terms of brightness, the ThinkPad T440p hits 255 cd/m² in the middle, while the ThinkPad T440s sits at 230 cd/m². 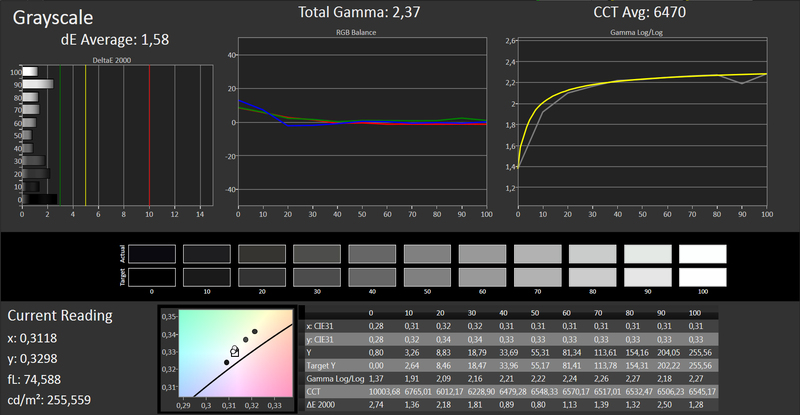 Therefore, the illumination of our current test machine is somewhat worse, at 86% instead of 91%. At minimal brightness, we measured 4 cd/m², and at level 12 we measured 141 cd/m². 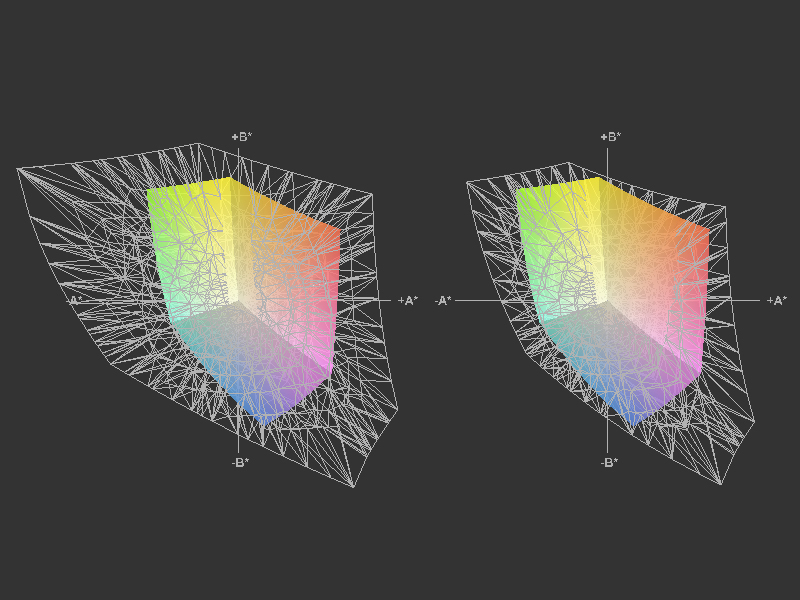 On the other hand, the contrast of 288:1 achieves a better result - measurably if not visibly. 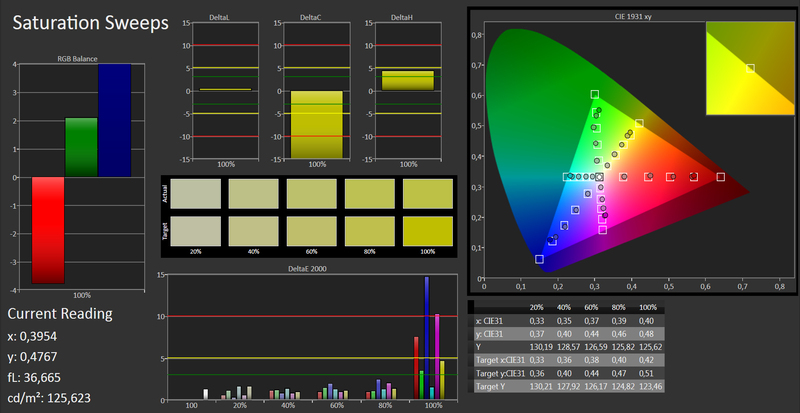 The colors appear dull, and a deep black is elusive in films and photos. 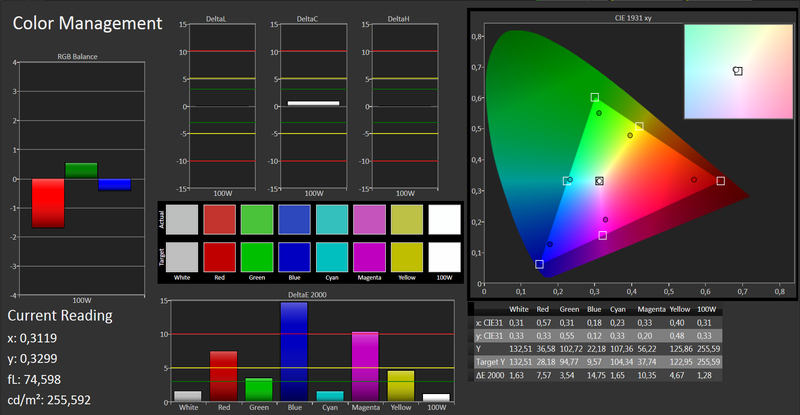 The color mask has 57% of the sRGB color space and is a major reason why this machine is not suitable for graphics editors. The additional measurements in terms of grayscale resolution, color fidelity and saturation are also not great, though they can be greatly improved with calibration. With red, blue, and magenta, the DeltaE 2000 deviations of 7.5 to over 14 are so high that it is basically impossible to work with accurate colors. One further drawback for the TN panel is the instability of the viewing angles. When viewing horizontally, the problem is relatively under control, and the variations in color and brightness are tolerable. 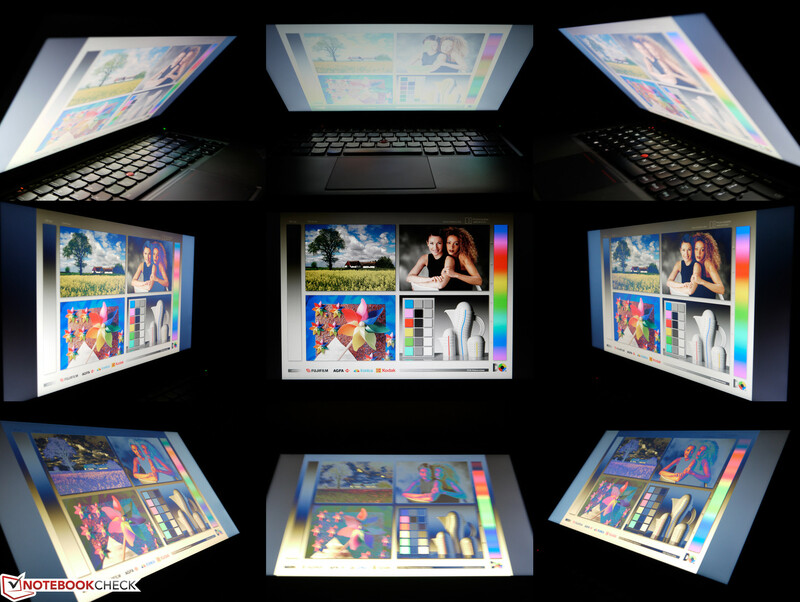 As soon as the display is tilted backwards or forwards, noticeable changes in the display appear, which lead to bleaching or inversion or colors. In usual office or Internet use, this is seldom a problem, but if photos or videos are involved, this criticism is worth taking seriously. 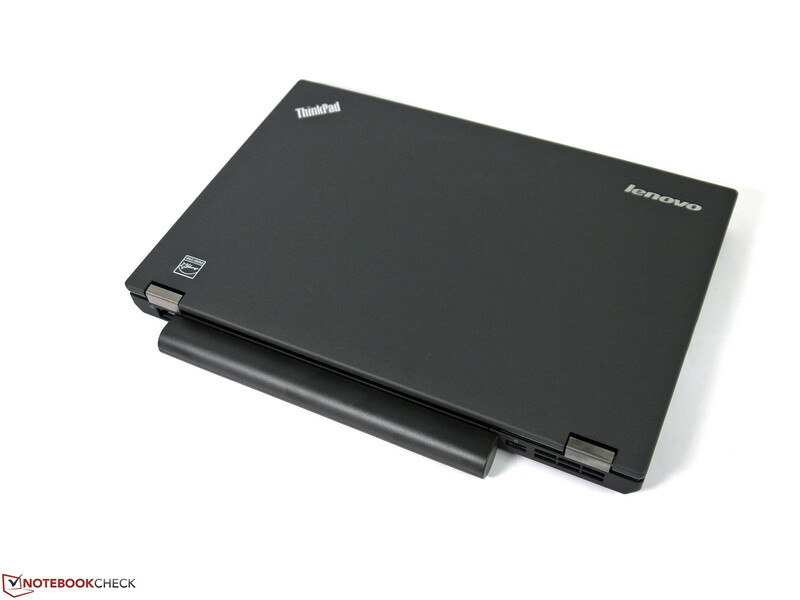 The Lenovo ThinkPad T440p can be configured in many different ways through Lenovo's web shop. Some highlights on offer: an Intel Core i7-4900MQ CPU, a 512 GB SSD and the previously mentioned IPS display. Buying up all the available shiny extras will increase the price from about 850 Euros (~$1,155) for the basic model to a hefty 2,500 Euros (~$3,400). Preconfigured models are available in-store for about 800 Euros (~$1,080) and are somewhat simply outfitted: Intel Core i3-4000M CPU, 4 GB RAM, and an HD Display. Certain important components - an IPS panel, SSDs, or the most powerful CPUs - are currently only available via Lenovo's online shop. Our test model has an Intel Core i7-4700MQ CPU, Nvidia’s GT 730M (Optimus with integrated Intel HD Graphics 4600), 8 GB RAM and a conventional 500 GB hard drive at its disposal. The price: just short of 1,600 Euros (~$2,175). The Intel Core i7-4700MQ quad-core built into this test model is one of the most high-performance mobile processors ever and offers excellent performance in every scenario. However, it also requires more power, with a Thermal Design Power (TDP) of 47 Watts, than the Intel Core i7-2-core (37 Watts) or the ULV processors (28 Watts) of the same generation (Haswell). When using software that can use fewer cores because of programming restrictions, the maximum cycle rate of 3,400 MHz has its advantages. In single-thread tests such as the SuperPi 32m or Cinebench R10 (64-bit single), we measured excellent results: 592 seconds and 6,394 points. 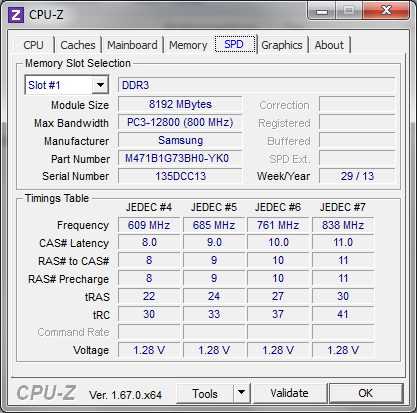 With tasks that could be performed across multiple threads, the quad-core benefitted from its Hyperthreading technology. Eight threads can be worked on in parallel. In comparison to 2-core processors, this gives a noticeable advantage in speed. The wPrime-1024 calculation (Multithread) was finished in 288 seconds, and the machine racked up 21,680 points in the Cinebench R10 test (64-bit multi). We did not measure any reduction in performance, even under prolonged full load. 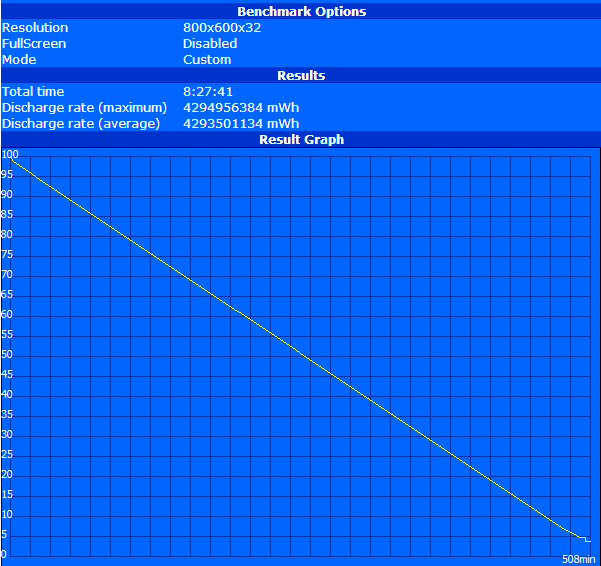 The Turbo Boost function available in Lenovo's Energy Manager had no measurable effect on performance. The fan's noise emissions became louder, but did not seem to achieve a cooler surface temperature. Under battery power, we sometimes achieved even better results than with the power cord plugged in: In Cinebench R11.5, for example, we achieved 6.1 points instead of 5.86. In terms of system performance, our test configuration suffered from its conventional hard drive (without SSD cache) and single-channel RAM. The dual-channel mode would be activated with a second RAM module, which leads to an improved performance on the order of 15 to 20%. 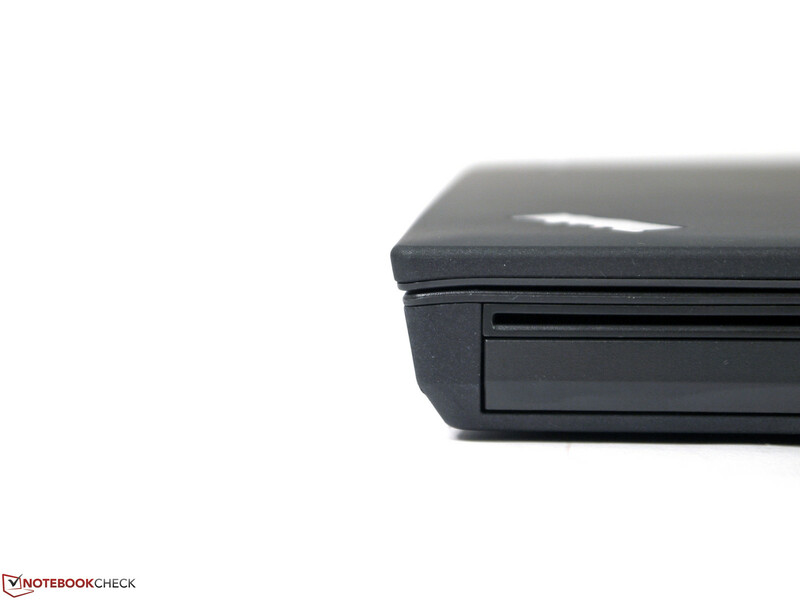 The conventional hard drive is one of the faster models that are currently available in notebooks. But still, in comparison to SSDs, the access times and maximum transfer rates are just not competitive anymore. The system benchmarks - measured using PC Mark Vantage (9,382 points) and PC Mark 7 (2,915 points) - would certainly be better with higher-performance components. Still, the everyday feeling of speed is much more important for practical use. With a solid-state drive, programs and documents open noticeably faster, and the system's reaction time seems much faster. 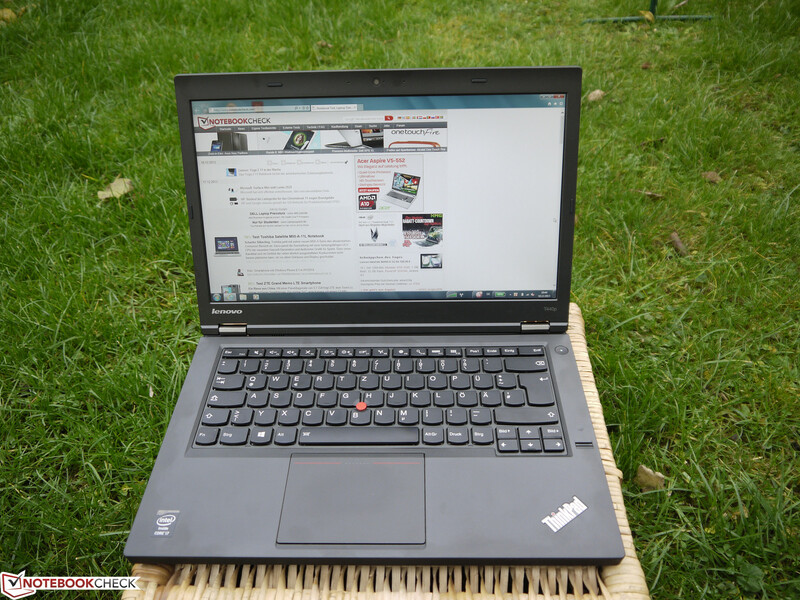 Apart from this, in terms of performance, the ThinkPad T440p is well equipped for almost all tasks. 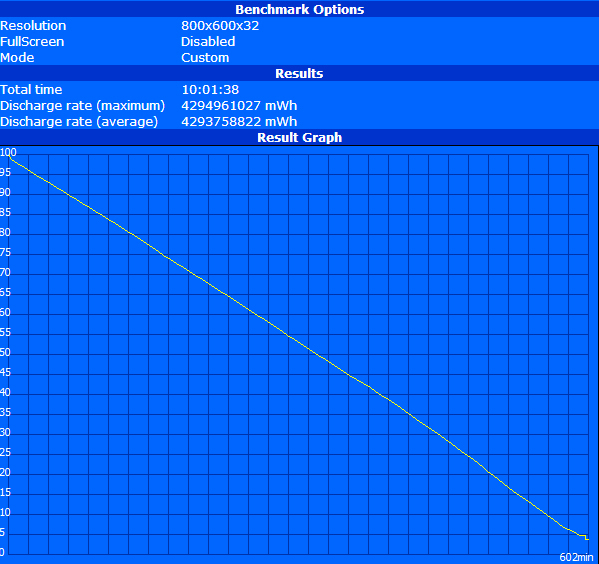 The exceptions to this verdict: OpenGL-optimized CAD programs or performance-heavy 3D games. The conventional Hitachi hard drive works at a maximum of 7,200 rpm and offers a capacity of 500 GB. It delivers a respectable performance: a maximum transfer rate of 132 MB/s and a mid-range of 92 MB/s. In comparison with other current drives, however, this conventional storage technology is behind the times; only the cheap price makes it worthwhile. Solid-state drives impress us much more, with their short access times, much faster transfer rates, light weight and (in the case of mSATA and M.2 cards) minimal space needs. 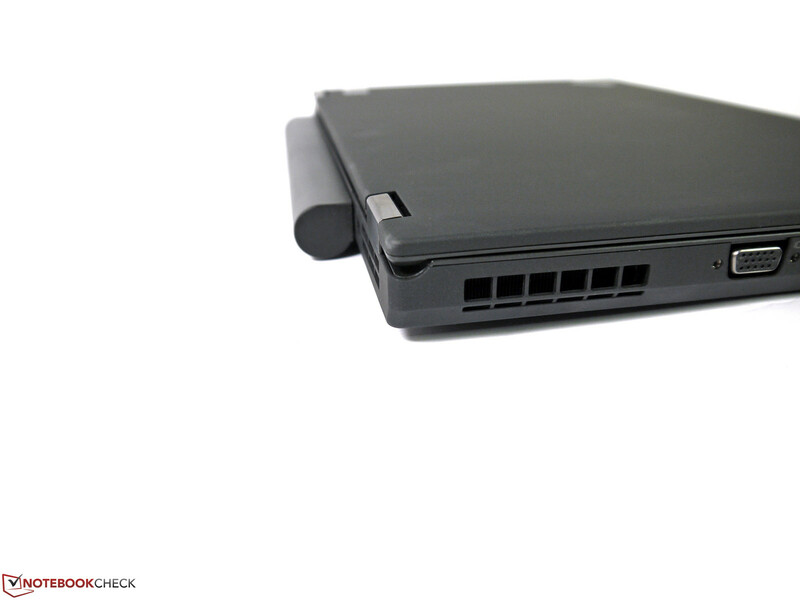 In order to shorten the system start and open often-used programs more quickly, Lenovo offers an SSD cache module in combination with its conventional hard drive. This has a capacity of 16 GB, is integrated in the M.2 slot, and has a price in the online store of 42 Euros (~$60). For users who need lots of storage space, this might be an acceptable compromise. 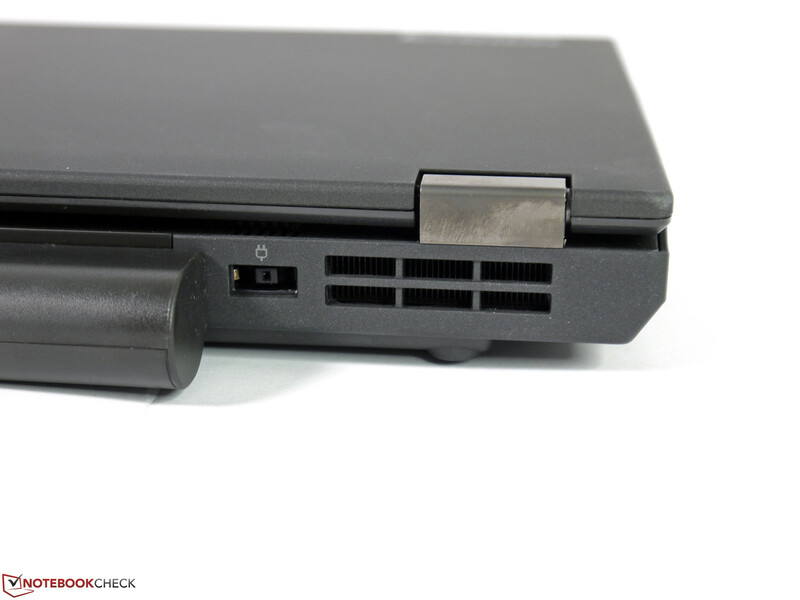 Our Lenovo ThinkPad T440p has two usable graphics chips at its disposal. Using Nvidia's Optimus technology, the integrated Intel HD Graphics 4600 as well as the dedicated Nvidia GeForce GT 730M can be accessed. 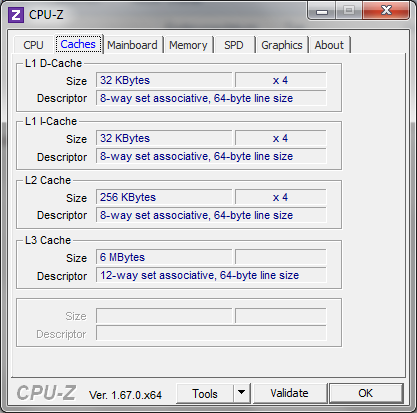 The GPU can make the selection automatically, or the user can do so, as desired. 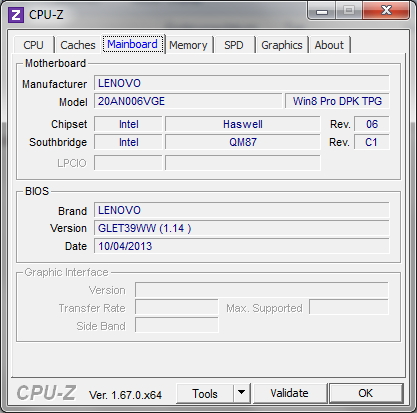 Since Nvidia's Optimus works very reliably, users can generally rely on the automatic function. We only wondered in which cases the dedicated graphics card would ever have had noticeably better results than the integrated graphics system. For the usual office tasks, the spartan Intel graphics card is definitely preferable. But even for more unusual tasks, such as video conversion via Quick Sync Video, the Intel system works faster and uses less energy than Nvidia's CUDA technology. 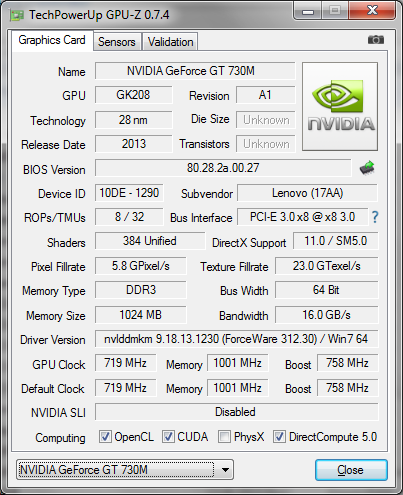 In matters concerning the graphics interface OpenCL, Nvidia's GT 730M is just as unconvincing (see image). 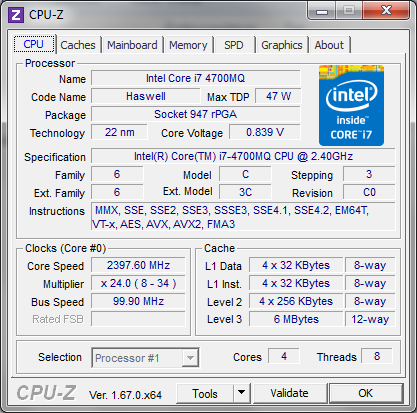 OpenCL is often used for graphics and video editing programs, where filters and image enhancers are processed through the graphics chip. The few practical scenarios where Nvidia's GT 730M actually won points over the Intel HD Graphics 4600 were professional CAD applications, which use the DirectX interface instead of OpenGL. These include, for example, Autodesk Inventor or AutoCAD 2013. Apart from this particular target audience, the GeForce GT 730M's only other noticeable performance advantage is in the area of games. In the 3D graphics benchmarks, the system hit 6,489 points (3D Mark Vantage) and 1,886 points (3D Mark 11) with the dedicated graphics card. 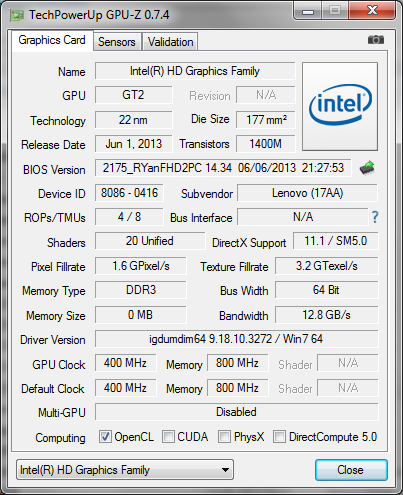 It racked up 6,794 points during Cinebench R10's OpenGL Shading test (64-bit). 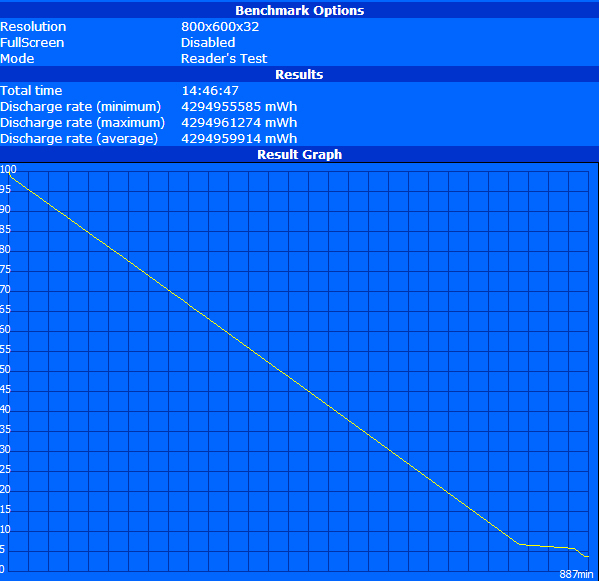 During battery use, we measured no reduction in performance. 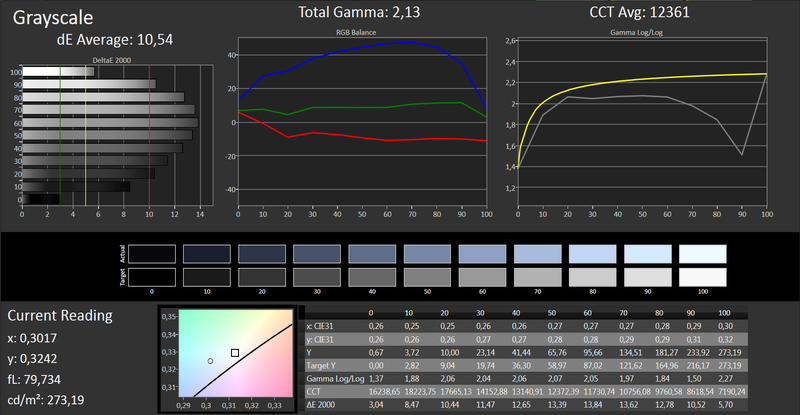 With Cinebench R11.5's OpenGL Shading test, we again got a slightly better result: 42.15 points instead of 42.06. Many games can be used without any problems with low- to moderate-quality performance settings. With titles such as Call of Duty: Black Ops 2 and Dead Space 3, even higher-quality performance settings are possible with FHD. Dishonored and FIFA 13 come off even better. 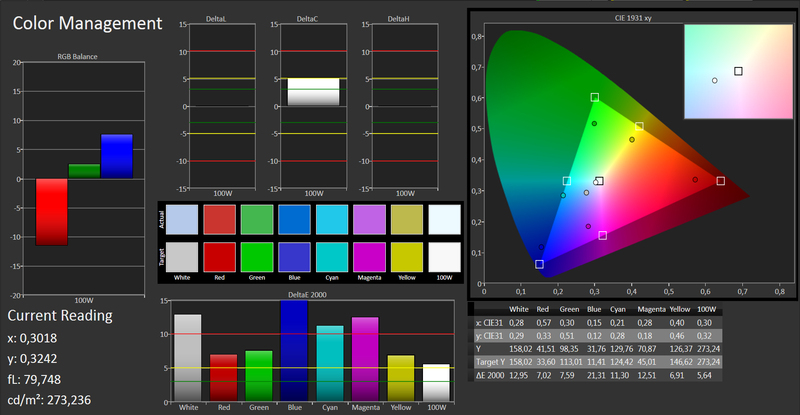 Users who prefer the native display resolutions of 1600x900 pixels can do so with a slight reduction in certain effects. Certain challenging games are not very playable, including games like Company of Heroes 2, Metro Last Light and Far Cry 3. Our gaming benchmark overview provides a comprehensive look at the performance of Nvidia's GT 730M in gaming of all kinds. 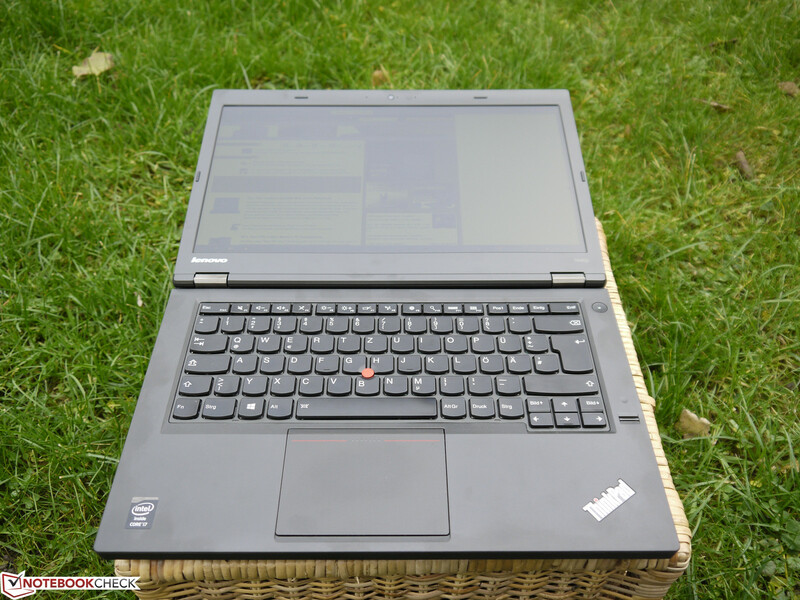 The ThinkPad T440p shows all the signs that it should be a very quiet notebook. 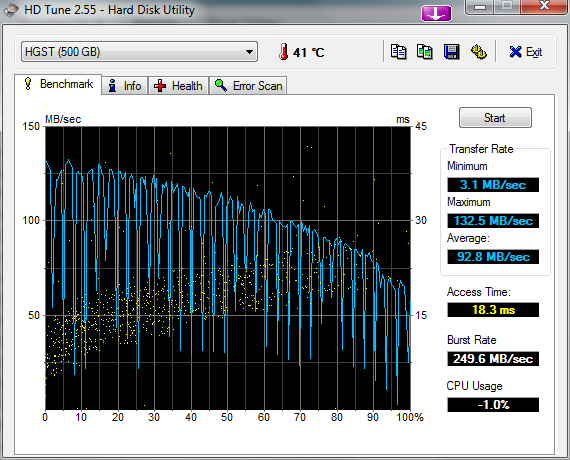 With a sound pressure level of 28.2 dB(A), the conventional hard drive is hardly audible. Under minimal load, the fan stays off for a long while, ensuring a very low noise level. If it had a solid-state drive, the machine would probably run silently. However, as soon as the fan turns on, the user is blasted by an unusually loud noise that sounds almost like gunfire - in our test model, at least. This could be because of a defective fan in our test machine. In the T-, S-, and X-series models that we have tested in previous years, we did not encounter this problem. Under full load in Turbo Boost mode (the setting in the Energy Manager with constant maximum fan use), we measured a maximum of 41.7 dB(A); in normal use, under moderate load, we measured a maximum of 40.1 dB(A). With deactivated Turbo mode, we measured maximum surface temperatures of 41.2 °C (106.2 °F) and 45.3 °C (113.5 °F) on the left side of the keyboard. If the user can tolerate a more active fan under full load, the temperatures sink slightly in this area, by about 3 - 4 °C (~7 °F). Under minimal load, temperature measurements all over the case remain around the 40-degree (104 °F) mark. We hit a measurement of 41.6 °C (106.9 °F; near the fan outlet) only on the underside. We did not notice any performance reductions in practical use during any of these situations. Users should just be a little careful around the fan outlet, since it can potentially reach up to 56.5 °C (133.7 °F). (-) The maximum temperature on the upper side is 45.3 °C / 114 F, compared to the average of 33.9 °C / 93 F, ranging from 21.2 to 62.5 °C for the class Office. 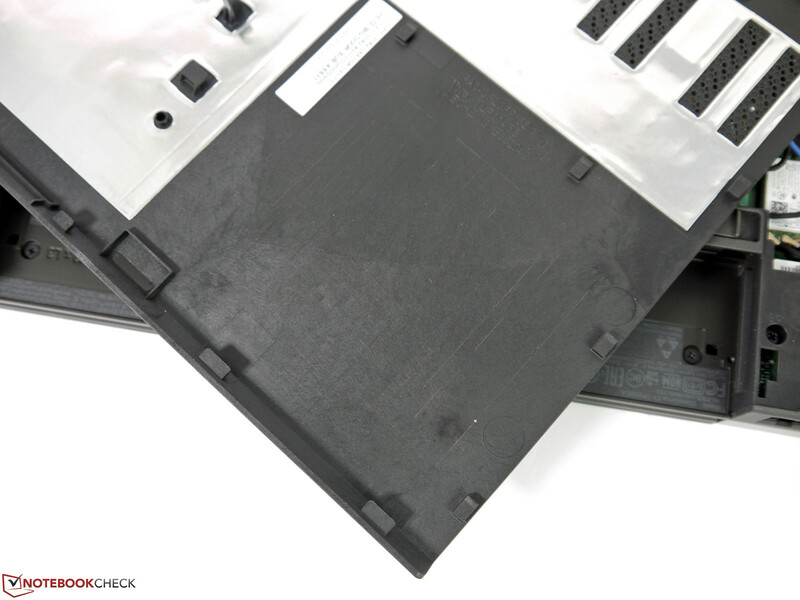 As is typical of business notebooks, the speaker boxes integrated in the front side deliver a flat, overly high sound. The mids and basses are as good as absent; belying the ThinkPad T440p's claim to be a multimedia-capable machine as far as sound goes. External speakers can be connected via Bluetooth or USB and would ensure a significant boost in sound quality. The combined 3.5-mm jack unites the headphone output with microphone input. Users who prefer to use headsets with both input and output cords will have to spring for an adapter or a new headset. 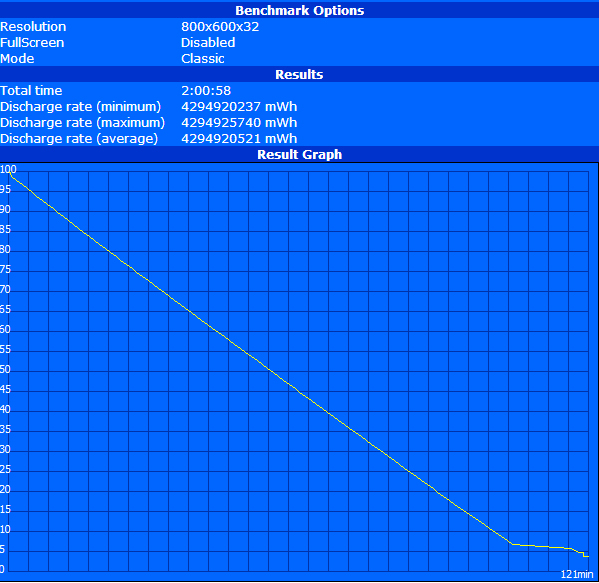 Power consumption oscillates between 5.1 and 72.6 Watts (under full load). The noticeably lower power needs under minimal load are not just thanks to the Haswell CPU, but also the very dark display (at just 4 cd/m²). When the display brightness is at maximum, the power draw increases by about 3 Watts. The power cord is rated at 135 Watts and thereby has more than enough reserves for the maximum power consumption of just under 73 Watts. That being said, the cord is quite large, and at almost 600 grams (~1.3 pounds), it is a hefty piece of equipment. The test model sports a large, 100-Wh battery, offering a large reserve of energy. 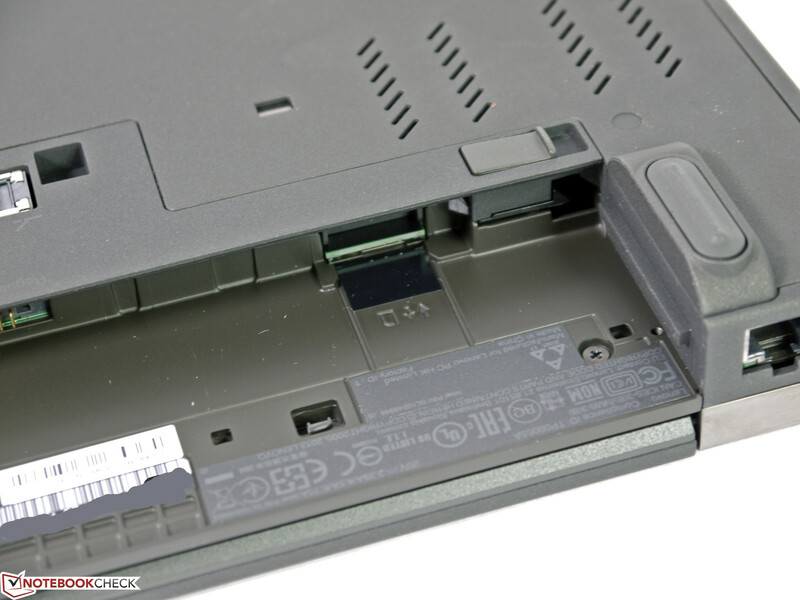 The battery bridge system that users may know from the ThinkPad T440s or the ThinkPad X240, with internal and switchable batteries, has not been realized in the T440p. As an alternative, a 6-cell battery with 56 Wh is available, though it offers a correspondingly lower battery life. The combination of low power consumption and a capacious battery leads in nearly every imaginable scenario to excellent battery life results. 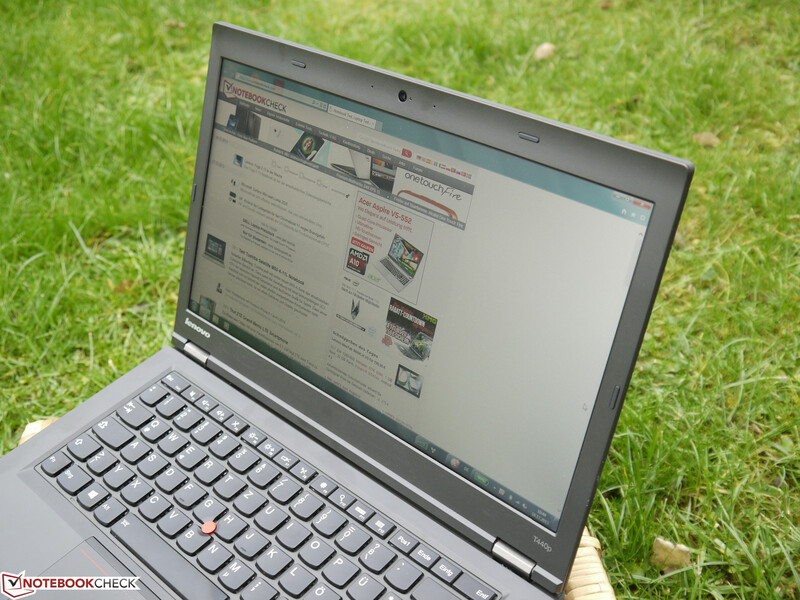 In the Battery Eater Reader’s Test (minimal display brightness of 4 cd/m², energy-saver mode, airplane mode), our ThinkPad T440p managed almost 15 hours. Since hardly any work can be done on such a dark screen, this is more or less a theoretical value. In the WLAN test, which better approximates practical conditions (display brightness level 12, 141 cd/m², energy-saver mode, wireless on), 10 of those 15 hours remain available, which is perfectly useful for most workdays. During our video test, using the FHD film "Big Bug Bunny," the same settings with deactivated Wi-Fi yielded 8:28 hours of usability. This is still an excellent value and would probably suffice for a regular workday. During the more intensive Battery Eater Classic Test (maximum display brightness, high-performance profile, wireless on), the runtime falls dramatically to just about 2 hours. 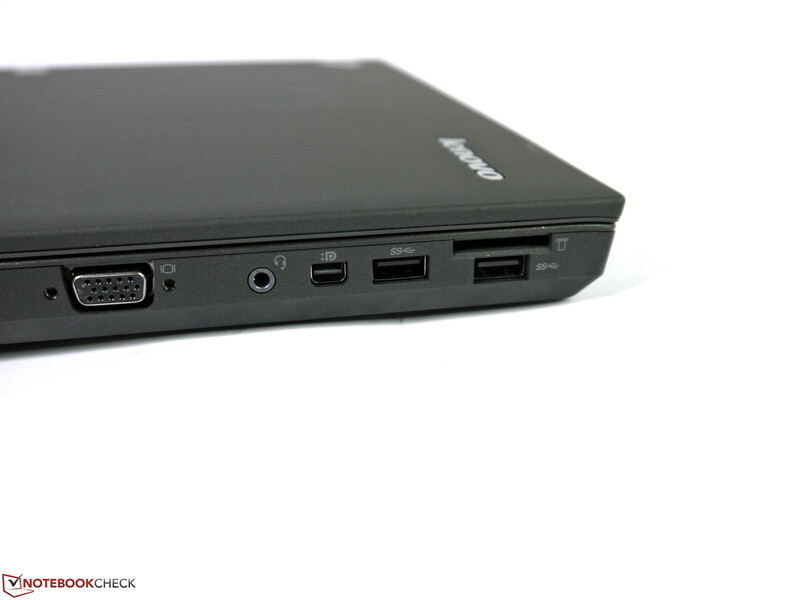 The Lenovo ThinkPad T440p is a powerful, well-equipped business notebook. Above all, the high-performance quad-core processor is quite convincing for a compact 14-inch model. The mobility is at an acceptable level and benefits from the large 100-W battery, without compromising the interface or upgradability. The keyboard supports multiple users and boasts a comfortable backlighting. We were less impressed by the display. 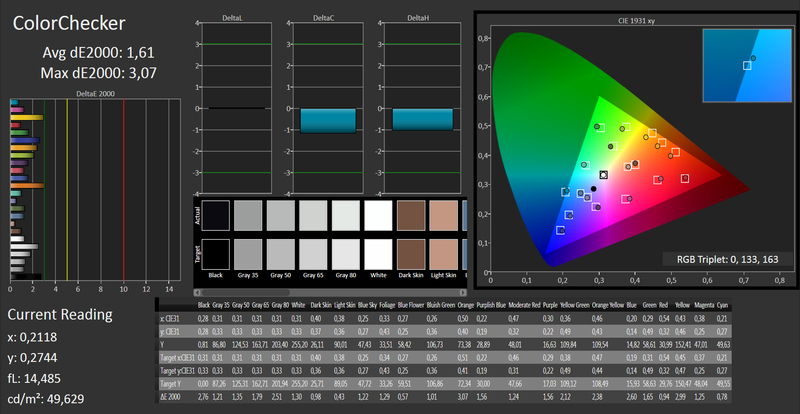 It is matte and bright; the meager vertical viewing angle stability as well as the weak contrast and color mask disqualify this model from the class suited for professional use. The new design of the docking and power ports can make things difficult for customers who use a variety of devices. Previous upgrades cannot be used with the new model, requiring several new purchases. The test model's problems with its fan are a peculiarity all its own. This probably has to do with a defect that does not come up in the rest of the series. Apart from these criticisms, Lenovo has also failed to fix weak points in the case that also afflicted its earlier models. In practice, the dedicated Nvidia graphics system can only distinguish itself within a strictly constrained area (when compared to the integrated Intel graphics card). The five-key ClickPad also takes a lot of getting used to. 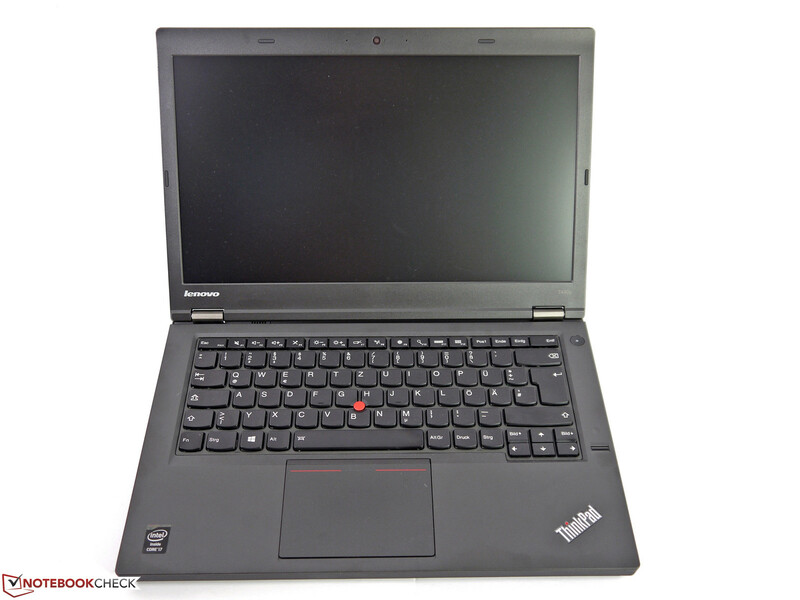 Thanks to the many configuration options in Lenovo's web shop, users can easily customize the ThinkPad T440p to their own needs and thereby eliminate some of the disadvantages of the default settings. ...and merges good performance with very good battery life. ...and thereby offers a better-furnished interface and the opportunity for upgrades and individualized settings. With a weight of 2.2 kg and an extremely practical battery life of up to 10 hours, it's neither a lightweight nor a colossus. The 720p webcam is good enough for video chats in well-lit rooms. Most important functions can be activated with FN keys. 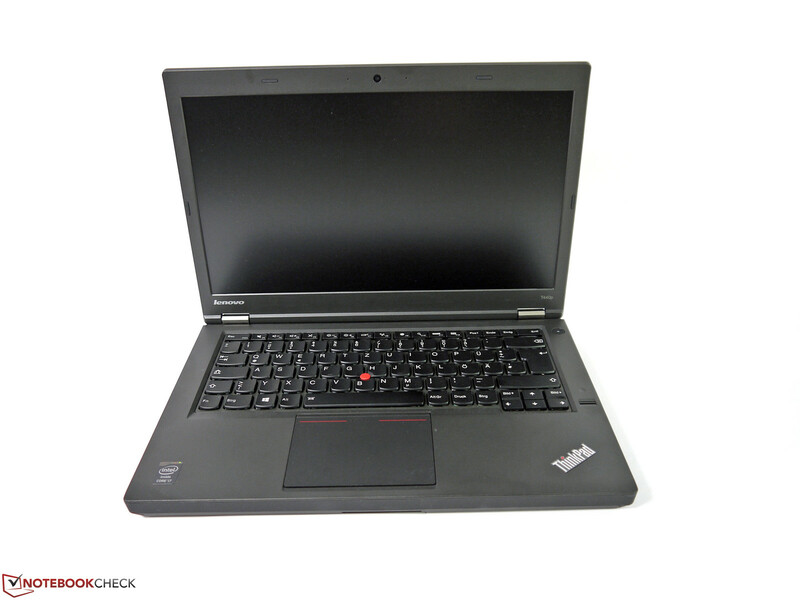 The look of the ThinkPad is, again, classic - plain and decidedly conservative. In our test model, the fan was quite disruptive with its constant rattling. Some ports are packed in tight and might block their neighbors with plugged-in components. 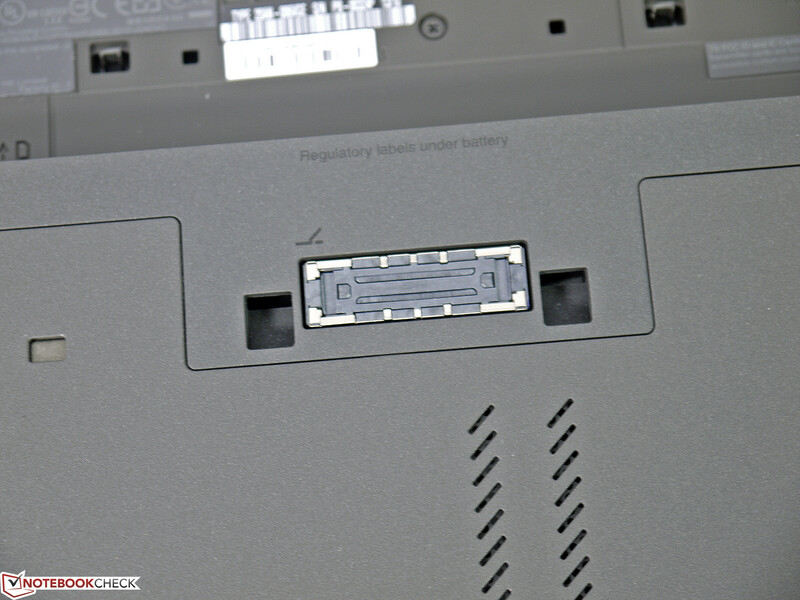 ...power ports are positioned to the rear, causing no trouble. On the right side, both USB 2.0 ports have a lot of space. 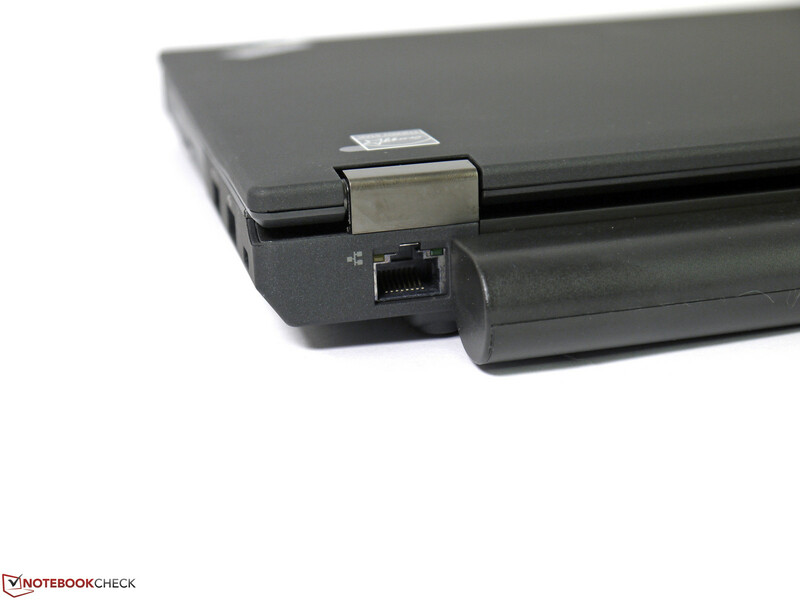 The smart card reader and the optical drive cause some material weakness in the wrist rest above them. It's only just possible to recognize the original clamshell design from which this model sprang. The power cord offers powerful performance, but it is also large and heavy. With a rated power of 135 W, it suffices even for more power-hungry variants. The 100-Wh battery increases the weight but nearly doubles the runtime. The maintenance hatch is secured with two screws. The docking port has been tweaked and is no longer compatible with its predecessors. The SIM slot for the WWAN module is located in the battery compartment. The most important components are easy to access. The conventional hard drive can be swapped out. It is also possible to add a second RAM module. The maintenance hatch consists of plastic, but it is pretty robust for all that. The large battery sticks noticeably out of the case. The successful combination of high-performance quad-core CPU and long battery life. The numerous ports are appropriate, and the keyboard is, as usual, one of the best. A less annoying fan (probably specific to our test product), an improved HD+ display and a dedicated graphics card that can work independently of the integrated graphics system. That Lenovo failed to fix known weaknesses of the case and builds outmoded displays (with the exception of the IPS FHD) even into the Premium T-series.